The An-12 (NATO reporting name 'Cub') is a military development of the An-10 airliner. The An-12 prototype (7900101) built at Irkutsk, flew first on 16 December 1957 powered by four Kuznetsov NK-4 turboprops of 4,000 horsepower and differs from the An-10 in featuring a more upswept rear fuselage and rear loading ramp, entering service in 1959. Fully pressurised, the An-12 has high performance yet can operate from unpaved surfaces. At least one was fitted with large skis with shallow V planing surfaces equipped with heating (to prevent sticking to ice or snow) and brakes. Nearly all have the tail turret, and under the transparent nose is a weather and mapping radar. The rear ramp door is made in left and right halves which can be folded upwards inside the fuselage, either for loading heavy freight with the aid of a built-in gantry or for the dispatch of 100 paratroops in less than one minute. The An-12 BP became the standard Soviet Air Force cargo and paratroop transport since 1960, also being exported for both military and commercial use to the air forces of India, Egypt, Indonesia, Poland, Iraq, Algeria and Bangladesh and to 70 other freight operators. Powered by four 4,000 ehp (2 985 kW) Al-20K turboprops, standard transport variants of the An-12 have been adapted for EW and ELINT duty with SovAir and SovNavAir. Variants include Cub-A and Cub-B for ELINT role and Cub-C and Cub-P with varying antenna and radomes, to perform passive and active ECM duty. With a max payload of 20,500 kg or up to 4 crew and 90 troops, series production of the An-12 in a number of variants continued until 1973. Around 1,400 were built with AI-20K engines and the type was also produced by Shaanxi Aircraft Company, China as the Yunshuji-8 (Y-8) redesigned transport version and derivatives. The first Shaanxi Y8, assembled from Russian components, flew in December 1974, the first Chinese-manufactured example following a year later. About 200 remained in service in civil marks in 1992, including some working as aerial laboratories, with industry and with the WA (Air Force Transport Service) in Aeroflot colours, plus at least 25 An-12BK/PP/PPS "Cub-A/B/C/D" electronic warfare conversions in air forces and Naval Aviation. 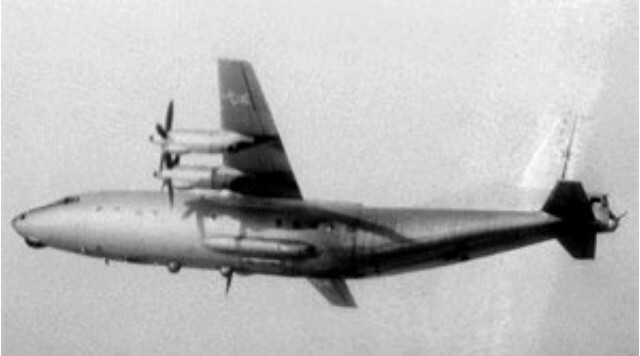 The An-12 was gradually superseded by the Il-76 with the Soviet forces from 1974. Engines: 4 x Ivchenko Al-20K turboprop, 4,000 ehp (2 985 kW). Payload: 44,090 lb (20,000 kg) of freight or 100 troops. Range with full payload: 2,236 miles (3600 km). Armament: powered tail turret with two 23 mm NR-23 cannon.